Insurance denied her chemo treatment. But it covered drugs for suicide. 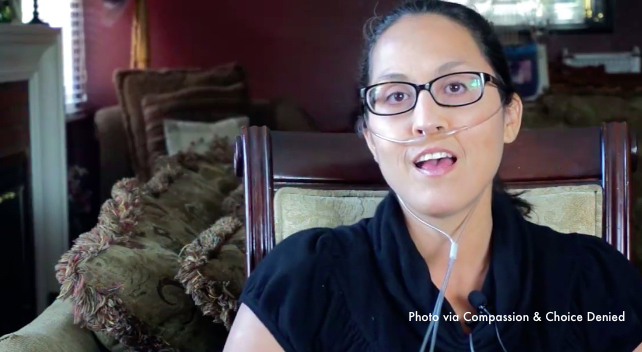 When assisted suicide legislation was officially passed in California in 2016, Packer experienced the ultimate slap in the face: her insurance company denied the coverage of critical chemotherapy treatment that her doctors recommended for her condition. Her insurance would, however, cover end-of-life drugs for just $1.20. “It was like someone had just hit me in the gut,” said Packer, who shared her story in the new documentary, Compassion and Choice Denied. Produced by the Center for Bioethics and Culture Network, the documentary details Packer’s experience of living with a terminal illness in an age where assisted suicide is cheaper than the fight for life. Particularly concerning: the insurance company had initially suggested that they would cover the chemotherapy drugs. It was one week after assisted suicide was legalized that they sent Packer a letter saying they were denying coverage. Despite multiple appeals, they continued to refuse. “As soon as this law was passed, patients fighting for a longer life end up getting denied treatment, because this will always be the cheapest option… it’s hard to financially fight,” Packer said in the documentary. Physician-assisted suicide is legal in a handful of states, and is on the ballot for voters in Colorado this fall. The push to legalize assisted suicide has gained momentum since the high profile suicide of cancer patient Brittany Maynard in 2014. Many prominent Catholic leaders, such as Pope Francis, have spoken out against assisted suicide, calling it “false compassion.” Los Angeles Archbishop Jose Gomez has said that assisted suicide “represents a failure of solidarity” and abandons the most vulnerable in society. Packer leads support groups for individuals with terminal and chronic illnesses. She said there was a clear morale change in many of the group members when physician-assisted suicide became legalized in her state. “Normally, we would talk about support and love, and we would be there for each other, and just encourage them that, you know, today is a bad day, tomorrow doesn’t have to be,” she said. But when assisted suicide was legalized, individuals became more depressed, with some saying that they wanted to end their lives. We are making the full film available free of charge here on Facebook because of how important this issue is. She also said that assisted suicide proponents have twisted the meaning of suicide to make it sound “sweet and pretty,” and have also redefined what it means to live with a terminal illness. “It makes terminally ill patients feel ‘less than,’ that they are not worthy of that fight, that they’re not worth it,” she said. Packer pointed to other resources, saying that there is a whole treasury of support for terminal patients – financially, psychologically, physically, and even if patients just need someone to talk to. While life-affirming palliative care remains an expensive medical cost, Packer recommended that more energy and resources fund hospice care, instead of making death the cheaper option. Editor’s Note: This article was first printed at Catholic News Agency on October 19, 2016, and is reprinted here with permission.